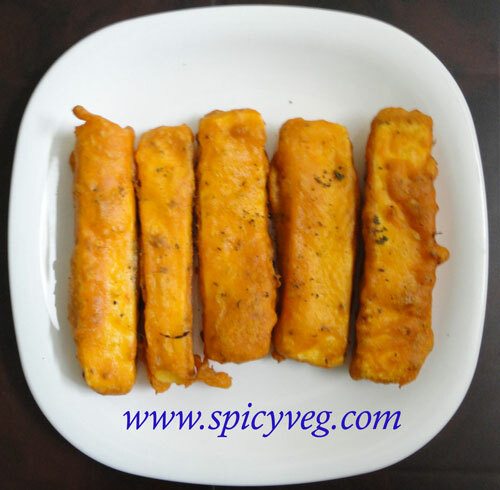 These mouth watering paneer fingers are dusted with spices and gram flour (besan) then deep fried till crisp and golden. 1.Cut paneer into thin long fingers. 2.Mix ginger- garlic paste,ajwain,food colour,salt,pepper & red chilli powder in a bowl. 3.Add the paneer fingers,mix gently so that all the sides of paneer gets coated with the spices.keep paneer aside till serving time. 4.At serving time,heat oil in a kadai on medium heat. 5.Spread besan in a flat plate.Pick up one piece of paneer at a time and coat with the besan spread in the plate.Coat on all sides.Repeat for all the paneer pieces.Add more besan if required. 6.Deep fry till crisp and golden brown.Drain on paper napkins.Serve generously sprinkled with chaat masala.